She was a 12-year veteran of the force and the wife of a retired police officer. An Illinois state trooper died in the line of duty on Thursday when a semitrailer slammed into her during a highway traffic stop. 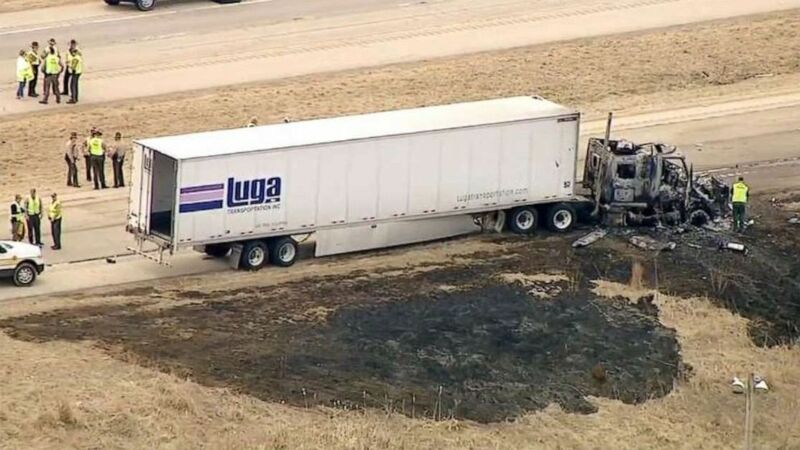 Brooke Jones-Story, 34, was on the shoulder of U.S. Highway 20 in northern Illinois at around 12:20 p.m. when a semitrailer veered off the roadway, striking the officer, her squad car and the commercial tractor-trailer she was inspecting at the time, state police said. The impact of the crash caused both trucks to burst into flames, covering the surrounding area with thick clouds of dark gray smoke, according to social media video. Brendan Kelly, acting director of Illinois State Police, said she was a 12-year veteran of the force and the wife of a retired Illinois State Police officer. He described her death as "tragic and untimely." 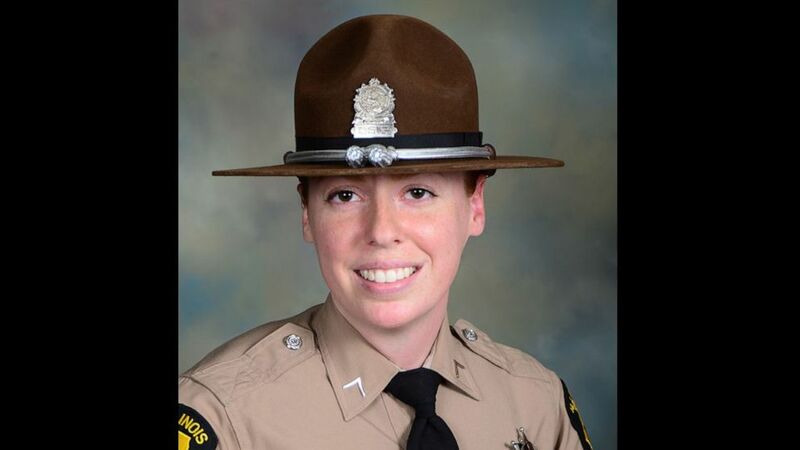 (Illinois State Police) Illinois state trooper Brooke Jones-Story, 34, was conducting a traffic stop on the shoulder of U.S. Highway 20 on Thursday, March 28, 2019, when a truck crashed into her. The unidentified driver who hit Jones-Story was cited with a violation of Scott’s Law, which mandates that drivers must use caution around emergency vehicles, and improper lane usage. The investigation remains ongoing. At least 15 troopers have been involved in similar roadside crashes throughout the state this year, according to Kelly. Another state trooper was hit and killed outside his squad car in January. (WLS) Illinois state trooper Brooke Jones-Story, 34, was conducting a traffic stop on the shoulder of U.S. Highway 20 when a truck crashed into her. Jones-Story's death comes just days after Illinois Gov. J.B. Pritzker vowed to strengthen efforts to enforce Scott's Law. 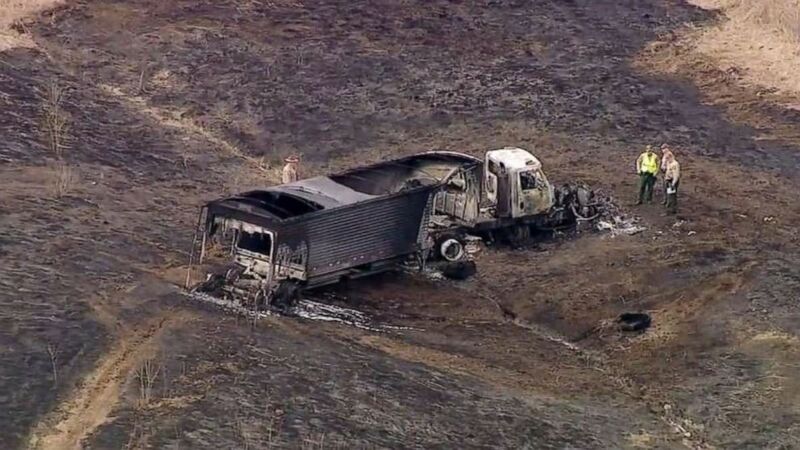 (WLS) An Illinois state trooper died in the line of duty on Thursday, March 29, 2019, when a semi-tractortrailer slammed into her. State police mourned the fallen officer with a highway procession near the scene of the crash on Thursday. Highway officials also displayed a special overhead message on roadways in the wake of the tragedy: ENOUGH IS ENOUGH SCOTT'S LAW = MOVE OVER SLOW DOWN.